On Monday evening, the National Commission for Universal Healthcare continued its extensive public consultation campaign where citizens and residents will have a say in customizing their future medical protection. The universal healthcare town hall meeting was held at the Anglican Church hall in Sandy Point. They also outlined proposed details for financing options, collection of data, and proposed benefit packages for the country. 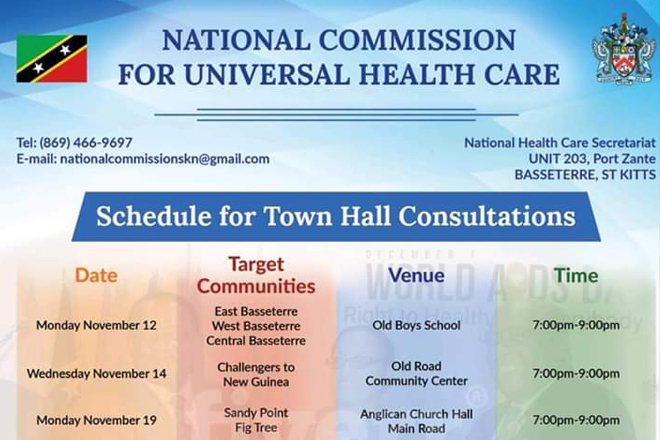 The town hall consultations will begin in Nevis Tuesday November 20 with a meeting at the Bath Village basketball court and another on Thursday at the St. Paul’s Anglican church in Nevis. Consultations in St. Kitts will continue on Wednesday, November 21 at the St. Paul’s Primary School. The meetings are scheduled every Monday and Wednesday and run until December 10, 2018. The town hall schedule is posted online in the notices section of the sknis.kn website and ZIZOnline.com.